The French Baseball Softball Federation (FFBS, Didier Seminet President) hosted the 2nd international baseball tournament, "Yoshida Challenge", from August 31 to September 4, 2016 at the Templiers Senart facility just south of Paris. The tournament served as preparation for the 2016 European Championship in HOOFDDORP, Netherlands in the middle of September for France, Netherlands and Germany as well as a strong boost to the growth of baseball in Europe. 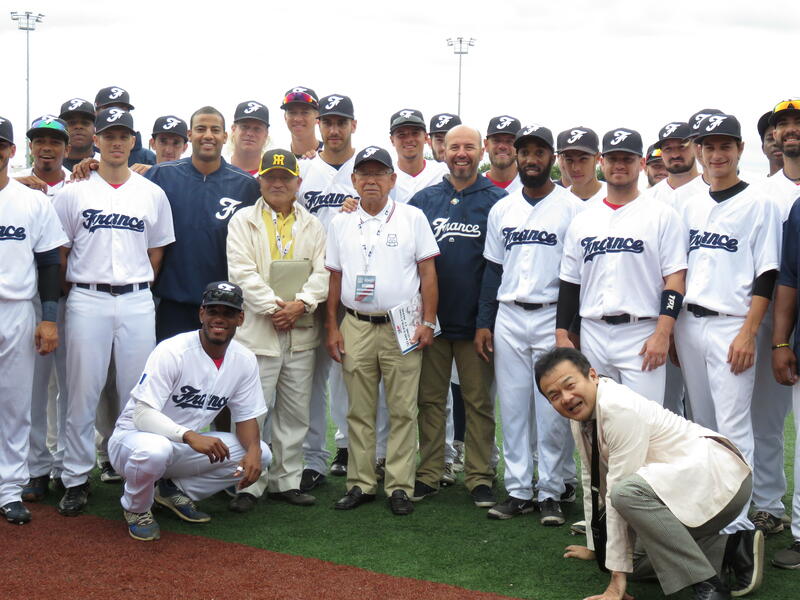 The tournament has been named as “Yoshida Challenge” to honor Yoshio YOSHIDA who managed the French National Team for 7 years from 1990 and helped them get to 4th at the European Baseball Championship in 1991 and 1993. No wonder FEBS and fans gave him a big welcome at Templiers Senart beginning with his ceremonial first pitch before the opening game between Germany and France and throughout the five-day series with YOSHIDA in attendance. He managed the Nippon Professional League’s Osaka Hanshin Tigers 3 times (1975-1977, 1985-1987, 1997-1998) before heading off to France in 1989. L'Équipe, French sports daily, called him “petit Samurai”. He is a Hall of Famer shortstop of Tigers and a highly popular TV commentator and columnist of baseball in Japan. On Day-4, a French outfielder, DAGNEAU　Bastien (21) took advice from YOSHIDA before stepping into the batter’s box and blasted the ball over the left-field fence. DAGNEAU was congratulated by Yoshida after the game and encouraged to play for big leagues. At the Award presenting ceremony after the final game between Germany and Netherland on Day-5, YOSHIDA presented Netherlands the Champion’s plaque. The former manager of Team France, YOSHIDA, was pleased with the remarkable growth of baseball in Europe both on skills and popularity, in particular among the young generation. At the same time, he emphasized that baseball/softball community should continue its drive to remain as Olympic sport after 2020 in Tokyo and beyond. YOSHIDA helped reinstatement of baseball/softball to 2020 Tokyo Olympics as an international baseball ambassador and was instrumental to assist organizing the inaugural “Yoshida Challenge” in September, 2014, when the 85th Inter-City Baseball Champion, Seino Transportation, took part with the 3 national teams of France, Belgium and Netherlands. 1. Netherlands 4W-0L, 2. Germany 2W-2L, 3. France 1W-3L, 4. Int’l 1W-3L. Netherlands0-10France, Sept. 4, Int’l-9France, Netherlands5-3Germany.